Eugeneans appear to be coming downtown at more typical levels than indicated with the sharp September downtown. QUESTION: How would you rate Downtown Eugene: excellent, good, fair, poor? 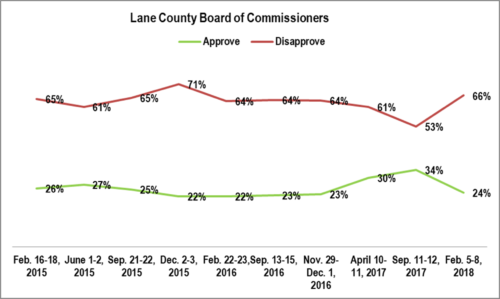 METHODOLOGY: 200 live telephone interviews of City of Eugene likely General Election voters were conducted each of June 1-2, 2015, September 21-22, 2015, September 13-15, 2016, December 2-3, 2015, September 13-15, 2016, April 10-11, 2017, September 11-12, 2017, and February 5-8, 2018. The margin of error at the sample median for each is 7%. Starting Thursday this blog will begin presenting updated polling on downtown Eugene. 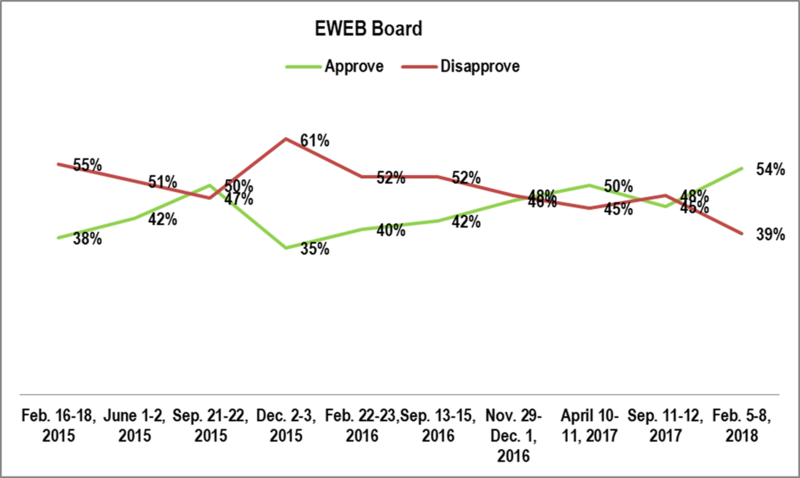 The EWEB Board’s rating has taken an upturn from its September 2017 level. 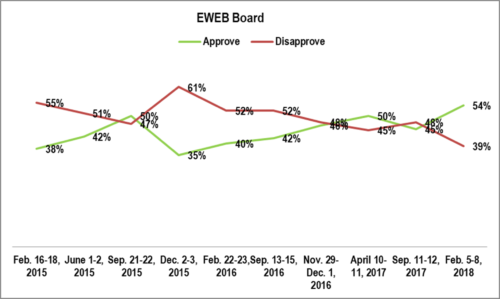 QUESTION: How would you rate the job the Eugene Water and Electric Board of Directors is doing: excellent, good, fair, poor? METHODOLOGY: 200 live telephone interviews of City of Eugene likely General Election voters were conducted each of February 16-18, 2015, June 1-2, 2015, September 21-22, 2015, December 2-3, 2015, February 22-23, 2016, September 13-15, 2016, November 29-December 1, 2016, April 10-11, 2017, September 11-12, 2017, and February 5-8, 2018. The margin of error at the sample median for each is 7%. The most important determinant of which group is party. 1. Bradshaw: ___ makes me feel much less safe and less likely to go to businesses there. 2. Philips: ___ makes me feel somewhat less safe and less likely to go to businesses there. 3. Andrews: ___ does not make me feel less safe and has no effect on whether I would go to businesses there. METHODOLOGY: 200 live telephone interviews of City of Eugene likely General Election voters were conducted each of June 1-2, 2015, September 21-22, 2015, September 13-15, 2016, December 2-3, 2015, September 13-15, 2016, April 10-11, 2017, and September 11-12, 2017. The margin of error at the sample median for each individual survey is 7%. Overall the margin of error is 3%. The LTD Board’s rating has improved among Eugeneans and keeps well above the September 2016 low. 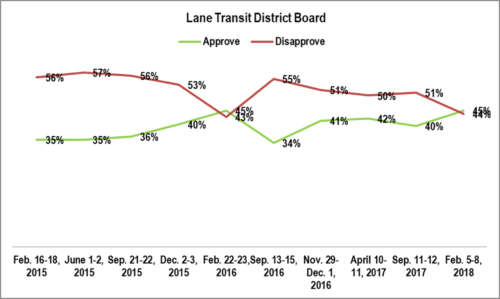 QUESTION: How would you rate the job the Lane Transit District Board of Directors is doing: excellent, good, fair, poor? 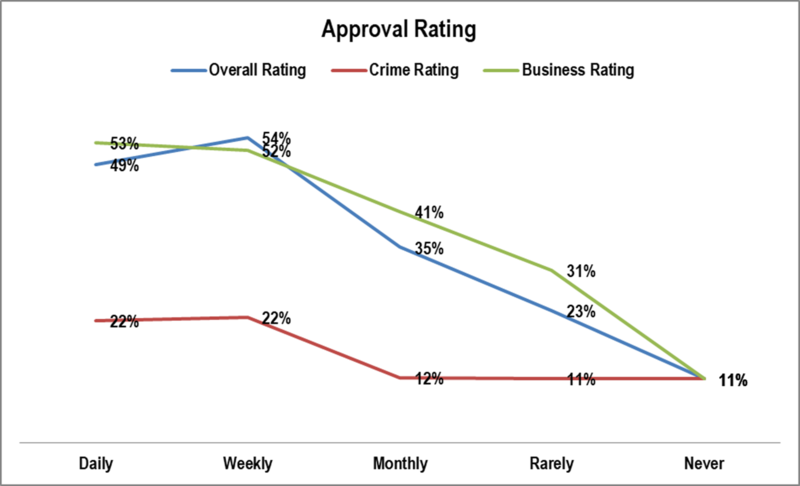 As with approving, there is something of a correlation between rating downtown excellent and the frequency of visiting. However, here the drop off from daily to weekly is much steeper. 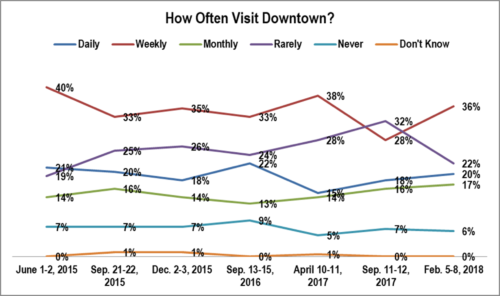 This post and the previous post show that surveys of downtown workers and visitors are likely to differ significantly from the city as a whole. This may or may not be a good thing – that depends on the objective of the survey. However, the difference is there and is significant and should be mentioned in any research report or evaluation. QUESTION: How often do you go to downtown Eugene: daily, weekly, monthly, rarely, never? QUESTION: How would you rate the crime problem in downtown Eugene: excellent, good, fair, poor? 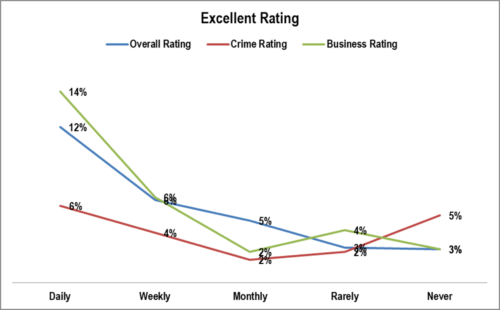 QUESTION: How would you rate the business environment in downtown Eugene: excellent, good, fair, poor? 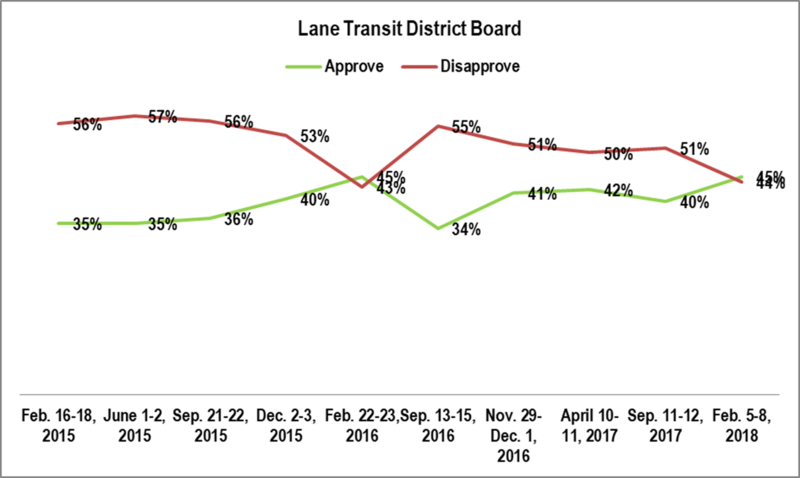 After significant improvement in 2017, the Lane Board’s rating in Eugene has taken a dramatic drop. 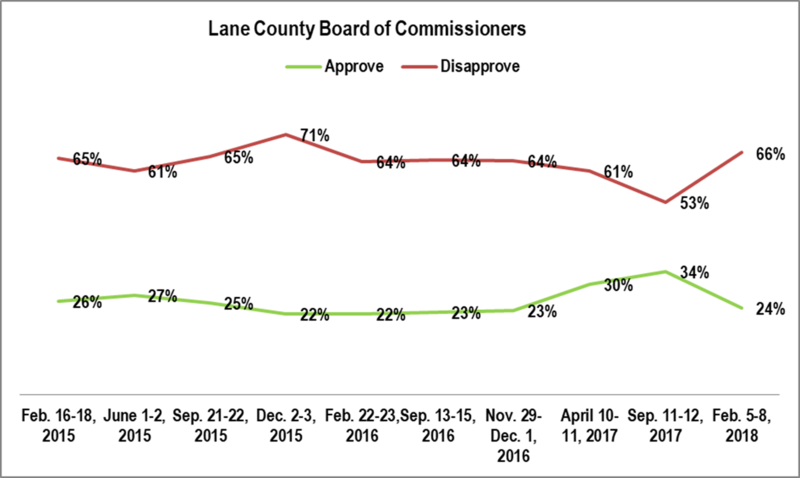 QUESTION: How would you rate the job the Lane County Board of Commissioners is doing: excellent, good, fair, poor? 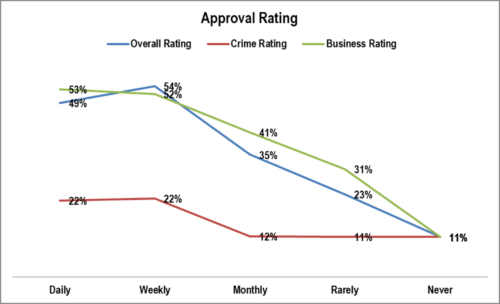 This graphic show the relationship between approval ratings and visiting frequency downtown. 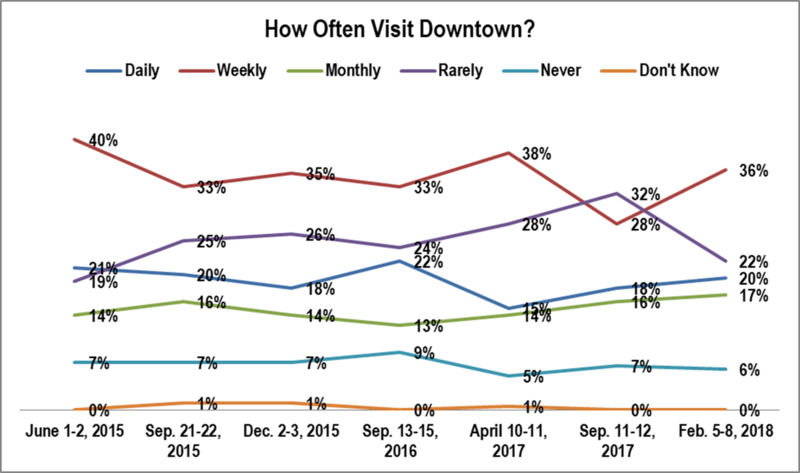 There is a definite positive relationship between visiting downtown and rating downtown: more visits mean higher ratings. Admittedly, none of the ratings are very good. This most likely implies one of two things. First, the people who know downtown best like it the best. Second, there is a kind of self-selection going on where those most likely to prefer downtown as it is. It is probably a combination of both.